The long-standing rivalry between the Green Bay Packers and Chicago Bears was still in its infancy as the two teams met in an early season game on September 27, 1925. 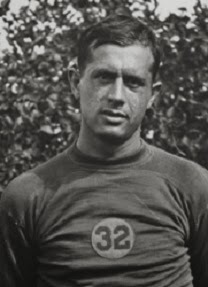 The Packers were coming off of a 7-4 tally in 1924, and while they had yet to experience a losing record in four NFL seasons (it was still the American Professional Football Association when they joined in 1921), they had never beaten Chicago. The team was led by its founder and player/coach Curly Lambeau and now had a new home venue in City Stadium, which was just completed prior to the start of the season. Green Bay was 1-0 after shutting out the Hammond Pros the previous week. The Bears were a powerful team and a good early test for the Packers. They were a perennial contender since entering the APFA as the Decatur Staleys in 1920, with the 1921 league championship under their belts, and placed second in the circuit with a 6-1-4 tally in ’24. George Halas co-owned and coached the club and also played end. Chicago battled Rock Island to a scoreless tie in its opening game. There were 5389 fans in attendance at City Stadium. The Bears put together a drive that reached the Green Bay one yard line before coming up empty when four runs into the line were stopped. 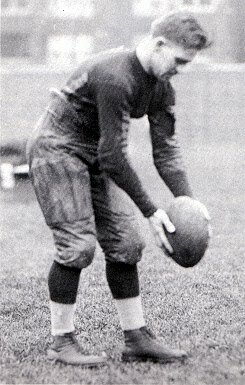 Stuck near their own end zone as a result, Verne Lewellen (pictured above) punted to get the Packers out of trouble. Another Lewellen punt pinned the Bears back deep in their own territory and, early in the second quarter, Duke Hanny had to punt in turn and guard Moose Gardner blocked it for Green Bay and recovered in the end zone for a touchdown. Cub Buck added the extra point. In the third quarter, a good punt return by back Joey Sternaman of the Bears (pictured at left) set up a score. After advancing into Green Bay territory, Sternaman kicked a 30-yard field goal to make it a 7-3 contest. Shortly thereafter center George Trafton broke through the line and blocked Lewellen’s punt which tackle Don Murry recovered for a Chicago touchdown. Sternaman kicked the point after and the visitors were in front by 10-7. Curly Lambeau, suffering from a back injury, entered the game to rally his team. The Packers got a break when Lewellen’s next punt hit one of the Bears and Green Bay recovered at the Chicago 30. They methodically moved to the two, keeping the ball on the ground with off-tackle plays, but the Bears stiffened on defense, pushing the Packers back on three more runs. On the first play of the fourth quarter, back Charlie Mathys threw to Lewellen for a four-yard TD. Buck again converted, and it proved to be enough. The Packers won by a final score of 14-10. Green Bay lost its next game but then reeled off four straight wins. However, a late-season slump that included a loss to the Bears at Chicago dropped the Packers out of contention and they ended up ninth in the division-less NFL with an 8-5 record. The Bears finished seventh at 9-5-3, but the bigger story for them came near the end of the regular season when they signed star HB Red Grange right at the conclusion of his brilliant college career at Illinois. He wasn’t much of a factor in what remained of the regular season, but became a key to two successful barnstorming tours.